Every year to encourage kids to read the Reading agency host a "Summer Reading Challenge". Agent M took part in the "Story Lab" challenge 2 years ago but due to me working so much last year he missed out on the "Creepy House" one. 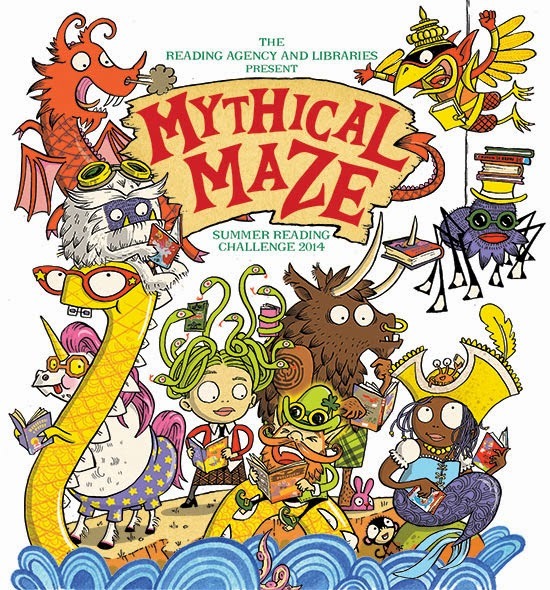 This year the theme is "Mythical Maze". Saturday was the launch and it didn't disappoint! We went down to the library and watched the show put on my Macastory. Agent M, along with all the other children, were enthralled the entire time and all the kids were encouraged to join in the singing and doing the actions. He had a brilliant time. 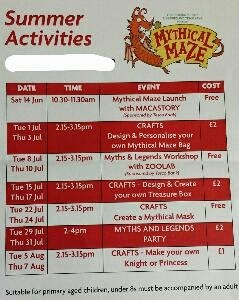 While we were there we got out his next lot of books (he takes out 5 every week) and signed him up for "Mythical Maze" so he can get started right away. 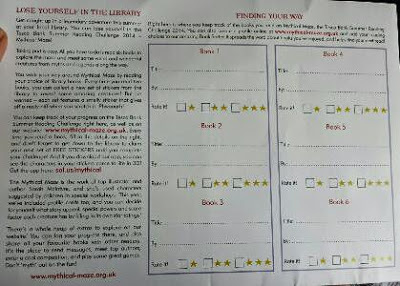 The premise is over the summer holiday, the kids have to borrow and read 6 books from the library and for each one they review they get a sticker to put on their chart. After all 6 books and all 6 stickers they will have completed the challenge and will be awarded with a certificate and a medal. They also have alot of activities to coincide with the challenge. Ive managed to book Agent M into some of the activities before and after our holiday so hes going to be kept busy and entertained. Some of the activities are free but even the ones that aren't are great value for what they do.